The ZX Spectrum version has a 1983 copyright date but the Dragon 32 version says 1982. I'm going to trust the latter--it feels like a 1982 game--and go with 1982 in my master game list. Commenter PK Thunder had a good point a couple weeks ago in relation to my characterization of Quest for the Key of Night Shade as an "excruciating pseudo-RPG." (I decided it didn't meet my rules and removed it from the list.) It's easy for me to sit here in 2014, my computer full of emulators that can play every platform from the 1980s, and dismiss a game as being superfluous or unimportant, but if you were a TRS-80 owner in 1983, Dungeons & Dragons, The Wizard's Castle, and Quest for the Key of Night Shade were pretty much all you had. You were probably happy for any RPG, pseudo- or otherwise. So imagine you're an eager young player in the United Kingdom in the early 1980s, and you've just unpackaged your new Dragon 32 or ZX Spectrum. Maybe in some magazines you've heard about the Wizardry or Ultima series in the U.S., and you start looking around for something to fill that RPG craving. You find nothing, unless you want to type the code for The Valley yourself. You start to suspect that the U.S. is going to dominate the Computer Age. Then a company like Wintersoft comes along and offers a game like Ring of Darkness. 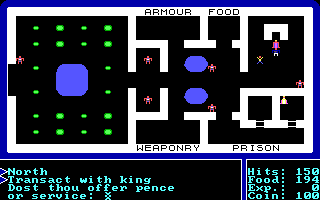 You don't care that it's a breathtakingly obvious ripoff of Ultima; it's not like Richard Garriott--the prick who has the audacity to call himself Lord British--was porting his stuff to your little Welsh machine. It's all you have, and you love it. Fighting an "evil ranger" in the wilderness between a river and a city. Overland, iconographic surface navigation is contrasted with first-person wireframe dungeon movement. The game has the same attributes, races, and character classes as Ultima, plus modifications to attributes based on race and class choices. The command list is copied almost directly from Ultima, including (K)limb, (Z)stats, and (I)nform and Search. Towns feature little counters selling weapons, armor, spells, and food. You engage them by walking up and hitting (T)ransact. Bartenders give hints when you buy drinks (Ultima). A king's castle features a princess in jail and a jester wandering around who steals from you. And guess what the jester has to say? You have to be #$&*@ kidding me. Take a look at the keyboard and tell me if that makes sense. And, no the Spectrum didn't have an arrangement in which it did. Reviews of the game at the time were also baffled. In addition to Ultima's "Ladder Up" and "Ladder Down" spells, there are some original to this game. "Magic Zapper" is just magic missile, but we also have "Unlock," "Create" (food, I assume), "Remove," "Jump," "Bridge," and "Kill." Since magic only works in dungeons, I assume that most of these spells have to do with obstacles and pits that you encounter there. The manual says nothing about the spells. In fact, there's hardly any documentation. You're told that "you are about to enter a strange world of challenges, surprises, and satisfying problems" (huh? ), and your ultimate goal is to "seek your fortune." A bit of drivel accompanies the opening screen, suggesting that the quest has something to do with finding five rings. That whole "one ring" business sounds familiar, but I can't quite place it. You start by assigning a pool of 40 points to three attributes: strength, intelligence, and dexterity, then choosing a race and class, which further modifies these statistics. Afterwards, you're dumped unceremoniously on an open landscape with 150 gold, 100 food, 2 daggers, a suit of leather armor, and 4 "magic zapper" spells. You need to immediately (R)eady your armor and weapons because random enemies start attacking quite quickly. Outdoor enemies include evil rangers, bandits, and--most annoying of all--"hidden archers." There doesn't seem to be any way to kill this enemy. If you try to (A)ttack, the game says you're out of range, and spells don't work in the wilderness. All you can do is flee, which takes several unsuccessful attempts (with you taking damage each time) before it works. What the hell is with these guys. The land is dotted with castle-cities, dungeons, and special locations like signs. All locations look like castles, which makes it hard when you're trying to find a specific place. The closest castle-city to the starting area is called Borderton. All of the castle-cities are laid out exactly the same and offer the same services: a weapon/armor shop, a transportation shop (incorrectly labeled "smith"), a pub where you can buy food and drink, a magic shop, a throne room, and a prison. Getting my first quest from the king. Versus getting my first quest from the king--also to find a signpost--in Ultima. The weapon shop only sold daggers, leather armor, and axes. I bought an axe right away and split the rest of my initial gold between hit points and food. The king gave me a quest to find "Sinclair's Sign" (perhaps a reference to the makers of the ZX Spectrum). I set out looking for it, but before I found it, I came upon the first dungeon: Doom Labyrinth. As I mentioned, dungeons are wireframe affairs with ladders, pits, hidden doors, chests, and basic enemy sketches as Akalabeth and Ultima. When you exit a dungeon, you receive a hit point reward related to the number and difficulty of the enemies you killed. This silly mechanism was tolerable in Akalabeth and Ultima--Garriott didn't have a lot of other templates to work with--but it seems absurd that someone actually thought it was worth emulating. Attacking a sad, confused-looking "etin" in a dungeon level. Speaking of emulating, I learned two new emulators for this game. The first, representing most of the screen shots above, was the "Spectaculator" emulator for the ZX Spectrum. It seems to work all right, but the game originally came on a double-sided tape, and I kept having problems with it crashing every time it asked me to flip the tape. The map doesn't appear to be the same as the Spectrum version, either. But the Dragon 32 version ended up giving me even more problems, including horrible error-trapping, which dumped me out of the game every time I pressed a key the game didn't expect. The emulator also didn't have a mechanism for speeding up the excruciatingly slow speed of the game, so I returned to the ZX Spectrum edition and toughed through my problems, which involved actually mimicking the rewind, stop, and start operations of the cassette. The beginning of the game is much like Ultima II, where survival is a constant problem and almost all of the money you make goes towards food. Unlike Ultima II, it doesn't appear that you can steal food. There's a (S)teal command in the game, but I can't get it to work even for a thief character. Food! What else would I steal? Actual valuables? Slaying enemies results in an immediate reward of experience points and gold. In the overland area, this seems to be somewhat random--I'll get anywhere from 2 to 8 from killing an evil ranger, for instance--but the dungeon creatures offer more consistency. I swiftly learned that screwing around in the overland area is a losing proposition. You don't make enough money from killing evil rangers et. al. to even come close to restoring the hit points they sap, particularly when you have to keep escaping the invulnerable hidden archers. Thus, I spent most of my first exploration session in the dungeon, where at least you get a hit point boost upon exiting and there are no archers. A few things make Ring of Darkness much harder than Akalabeth or Ultima. In both of the latter games, you could descend into a dungeon and have a reasonable chance of exiting with more hit points than you started. This rarely happens in Ring of Darkness, although you do end up slightly better off than you started thanks to the gold you accumulate. The key problem is that enemies always get the first attack. Whether you wander into a square next to them or wait for them to come to you, you never get to strike first. Adding to this, enemies stay in fixed squares until they "acquire" you, and many of those fixed squares are at intersections in the dungeon. It's not uncommon to move into a square and get a notice that you've been attacked by a thief (with a consequent loss of hit points). You don't know where he is, so you turn right, only to find an empty corridor. The thief attacks again. You turn around, and there he is. He attacks again. By now, you've lost one-third of the hit points that you had in the first place, and you haven't had a chance to strike a single blow. I also find that streaks in which I miss five or six times in a row are quite common. Facing a very badly-drawn skeleton in the dungeon. It's too bad I don't have any missile weapons to shoot him across the pit. Instead, I'll have to advance onto the pit, where he'll get the first attack. Nonetheless, through a combination of exiting when my hit points got too low, receiving my boost, returning to the castle to pay the king for more, and re-entering the dungeon, I managed to slowly earn the 1,024 experience points necessary to make Level 2. At this point, three new items appeared in the weapon/armor shop: a sword, a "spiked rope," and a suit of chain mail. The "spiked rope" sounded promising as a long-range weapon, and I thought it might help take out the hidden archers, but no, it doesn't work. During this time, I explored the map a little more and found Sinclair's Sign. At the sign, I found a suit of leather (echoing Ultima, where one of the sign posts gave you a weapon), and upon returning to the castle, I got some more experience and 416 gold from the king. Unlike Ultima, the king doesn't send you on the quest again. He simply says that his quest is done. Moving on through the only paths available within the natural barriers of water and mountains, I found my way to a second city, Port Stillwater, where the king asked me to kill a "jelly cube." There's a handy dungeon nearby where I could attempt that quest, though I don't know what level on which they appear. From Ultima, in the Lost King's Castle. From Ring of Darkness. The developers were so lazy they couldn't even think of a different creature for the player to kill. When you die in the game, you get "resurrected" in a random part of the map with 250 hit points and no apparent penalty to experience, gold, or items. An "inform and search" command finds hidden pits in dungeons. You basically have to use it on every corridor lest you go plummeting to the next level with no way back up. A pit right in front of a pit. Clever. The game copies Ultima in that a few monster types--thieves, skeletons, giant bats, giant rats--are always found on Level 1. Reach Level 2 and you get giant spiders and "etins" in addition to the above. I haven't yet made it to Level 3 or lower. The transportation shop sells a cart when you're Level 1 and a cart and a mule at Level 2. I wonder if it eventually offers a laser-armed hovercraft as in Ultima. Other than getting new items in the shops, I'm not sure what leveling does for you. It's unrelated to hit points, and it doesn't seem to make me more effective at combat. The above took me about 6 hours, and I don't imagine I'm very close to winning the game. As a gameplay experience, it's about as good as Ultima (although the fact that it plagiarized so heavily from Ultima makes it worse in general), which is a game I liked for historical value but wouldn't have wanted to play for more than the 8 hours it took me to beat it. But I haven't deliberately bailed on a game since Bloodwych two years ago (since then, the only winnable game I haven't won, Legend of Faerghail, was due to a irrecoverable bug), so I'll probably continue, see if I can beat it, and see if it has an original thought in its head. If I end up having to kill that jester for his key, freeing the princess, and getting a time machine, there's going to be hell to pay. It's weird how the mind works. Just seeing those graphics immediately gave me a tactile memory of the rubber keys under my fingertips. I never played (or heard of) this game, though. I didn't own a speccy myself (Beeb 4 Life, etc.) but my gran had one so we used to go there in the holidays and play games on it - mostly those action/adventure hybrids like Dizzy. I never knew the speccy had any true RPGs - I can't think of any on the beeb, either - so I'm very interested to see how this turns out. Oh, and I've got no idea about the choice of QWOP for the control scheme, either. It immediately made me think of the recent game of the same name, but I don't think the designer of that had Ring of Darkness in mind. The usual control scheme on the beeb was ZX:/ (the keyboard had a slightly different layout), which we used to just call Z, X, Up, Down as kids! Wild guess;- QWOP is French for QAOP (or AZ<>). On Azerty keyboards Q and W are where A and Z are on qwerty layouts. I'm kinda surprised that this game even exists - There wasn't really a much of a market for US style crpgs in the UK in 83 because disk based games tended to sell poorly due to the dominance of cheaper tape loaded software (blame Thatcher and the recession). That would only make sense if Q and W moved the character north and south, but they don't; they move the character west and south. Even on the Azerty, there's no layout that QWOP or QAOP makes any sense. Anyway, it's hard to see where a French game would have had any influence on this one. My thesis is that there just wasn't any sensible key group that worked. The Spectrum keyboard didn't have a numberpad or separate arrow keys. That leaves us with only a few combinations, all of which involve keys that had other uses in the game (WASD would be out because A is "Attack," for instance). Rather than re-program these other commands, the developers chose to just use "leftover" keys for movement. I can't help but think that someone disassembled Ultima II's IBM port, adapted it for the ZX Spectrum's Z80 CPU, and essentially re-published it with a few modifications. Of course, the IBM port was released a year later than this in 1983, so I don't know. I guess they could have worked off of the Apple's 6502 assembly, but that's not as much of a straight shot to the Z80 as the 8088/8086 was. Reading the article I was thinking this is almost an unlicensed port of Ultima/Ultima II. Just because of the odd ways that various things work, I strongly suspect that the developers had access to Ultima and studied it for what game elements they should include, but wrote their own code based on that. That seems to be saying their earlier game, Dragon Trek, was the one from the DnD friend, though. And Boots (the chemist) used to sell computer games!? I quite like the graphics - at least they are clear! To me the etin looks ticked off, like you just woke him up. As damaging to my manhood as it is, I've gotta say; the enemies in the dungeon looks way too adorable. The entire premise of Pokemon is enslaving the cutest things in the world and making them pit-fight, so I think I'm inured to the discomfort of injuring cute creatures. "Aww... look at that cute little Etin! Who wants a sword in the chest? Yes! You do!" I hope you can find the authors because there must be an interesting story behind this game. No game this blatantly a copy cannot have an interesting story. Either way, your streak of one post per 1983 games is ended! I AM going to try to reach them, but I wanted to see if I could get through the game first. The streak ended with Expedition Amazon, alas. If you finish the game, like I did as a teenager in the 1980's you will find their address. They should send you a nice little scroll of honor and a ring. When are you going to do 1990's "Bloodwych: The Extended Levels"? You may have to replay some of the original on the Amiga, but as you now do Amiga RPGs that should be fine right? I'm pretty sure I'm going to find an excuse to ditch that one. A quick google revealed that the Bloodwych Data Disk actually improves the game with more interaction (recruiting monsters! ), objects and monsters. And you don't need to replay Bloodwych, your imported characters will be raised to a proper level anyways. That's at least enough to quickly test the game. Still not too sure if that will help. That was a game I had access to in my youth, but never bothered to really play it - even though I loved dungeon crawlers. Chaos Strikes Back is an expansion? I thought it was a sequel, a completely different game. No, it's definitely an Expansion. Back then, sequels come in numbers and not subtitles. Nope, Chaos is a sequel not expansion. Expansions require original to run, sequels don't. Chaos Strikes back has the exact same engine as DM, the same items and monsters, only the graphics, characters and the dungeon were new. Maybe it was sold as expansion because the designers knew that the differences are marginal - or maybe because it would be too frustrating without knowing DM. Technically it's a sequel, that's true. In every case, it has less new stuff than the Bloodwych Expansion. Sucinum, I won't be able to import my characters because I played the DOS version, and the "extended levels" don't exist for the DOS version. Y'all are arguing semantics. Clearly, developers of the 1980s and early 1990s hadn't settled on what was a "sequel" and what was an "expansion." Let's not pretend that the language for these terms is absolute. Even today, there's all kinds of confusion. Assassin's Creed released two whole stand-alone games without making them numbered sequels. Generally speaking, if the new content (whatever we call it) requires the original game to play, I'll play it as part of the original game. If you play it as a separate installation, without the need for the original game, I'll play it as a new series. The only reason I didn't do this for Bloodwych is that I was still in "DOS-only" mode and the additional content wasn't availble for DOS. Despite what I said above, I'll try to get one posting out of the "extended levels" (probably the Atari ST version) though it's going to mean creating new characters. So... you are going to replay Bloodwych on the Atari ST so you can play more Bloodwych?
" Even today, there's all kinds of confusion. Assassin's Creed released two whole stand-alone games without making them numbered sequels." I still don't understand why the makers of GTA thought Vice City and San Andreas were less worthy of being numbered than GTA4 was. (Actually San Andreas might actually qualify as an RPG, since you do improve your character's ability stats by your actions). ug, I hate developers who do this. Your DooM list is flawed: DooM RL isn't an official product, DooM 3: Ressurection of Evil, and Master Levels for DooM II are expansion packs, Ultimate DooM and DooM 3: BFG edition are updated rereleases. As for the spinoffs, DooM 64 was a Nintendo 64 exclusive, and it was very common for franchises to have their sole outing on that console named as such. Final Doom was a pair of fan-made 32-level episodes that were so well done that ID bought them and resold them - giving them an out-of-sequence name was ID's way of saying "these aren't ours". The rest are different-genre mobile games. Gnoman: Sorry, I got lazy with that one and copy pasted off Wikipedia: I should have not copied the spinoff lists, and ordered it a bit better. The other two on the other hand.... Also: Man, you can tell you are one of the originals from back in the day, I've never seen someone write in DooM in modern times before. I was one of those youths with a spectrum but i never heard of this game. Hey, what a nice surprise to get name-checked -- thanks for that! And the TRS-80 reference is very fitting, since the Dragon 32 hardware is 99% the same as a TRS-80 Color Computer. In fact, I wonder if anyone has ever tried porting Ring of Darkness to the CoCo? BTW speaking of the CoCo: another Ultima clone for the machine -- Gates of Delirium, released by Diecom Products -- is currently on your list as released in 1987. However, some sources say it was a 1984 release. I'm looking into what year it actually came out, but one telling thing is that the instructions say it requires a "64k Color Computer". The CoCo 3 had come out in 1986, so if the game were really released in '87, I think they would've mentioned the CoCo 3. I'm guessing 1984 is the correct year. I'll move it to 1984 and check it out when I get there. Man, that's yet ANOTHER emulator I'll have to learn. MESS (Multi-Emulator Super System) covers almost very model of Trash-80 and CoCo ever, even though they originally tended not to be inter-compatible. MESS also handles every Spectrum model, and also ColecoVision, which came up the other day in a comment. You might want to check mess.org out. They handle a LOT of old systems (though not FM-Towns). According to this site, Gates of Delirium "turned out to be almost pure torture to play through, thanks to old school mechanics, irreversable puzzles that could permanently wreck the game, and a decided lack of story, plot, or character." Don't feel too bad if you don't get that emulator working, perhaps as an excuse to get out of playing this game *wink* *wink* *nudge* *nudge*. ^Heh. It definitely is a CRPG, though, whatever its flaws. Either way, I guess it really was a 1987 release -- there was a contest where you could win a CoCo 3 for solving the game, though for some reason the prize isn't mentioned in the manual -- so the Addict has a few years of reprieve before he "has" to face it. Speaking of Spectrum RPGs, there are probably a bunch of RPGs that worldofspectrum has filed as various types of adventures that aren't on your list yet. I just stumbled over "The Kinfgdom of Krell". Judging by the reviews, it's a tedious, icon-based graphic adventure, though 1 review also mentions that the attributes are pretty much copied from DnD. I'm not going to actively seek them out, but if people tell me about them, I'll add them to the list. I just put Kingdom of Krell on for 1987. > You're told that "you are about to enter a strange world of challenges, surprises, and satisfying problems"
To me, t sounds closer to solving puzzles, though I'm not sure this game has them. Puzzles are relatively common in CRPGs, though, so I don't think it's too unlikely. I finished the game today. There are no puzzles, satisfying or otherwise. Strange. It might be using satisfying as a verb, meaning to solve NPCs' problems if the game has that kind of thing, but it's too vague to say for certain. Was the game a generic Ultima rip off in the end or did it have some of its own new ideas? It paralleled Ultima all the way to the end. The second posting should come out on Friday. It's clear how Ultima was ripped off, but am I the only one who noticed that the graphics for the wireframe dungeons are identical to Dungeons of Daggorath? The spacing on the walls and the drawings of the pits and the ladders are too close also to be a coincidence. That game came out beforehand (Jan 1982). Above PK Thunder notes that the Dragon hardware is 99% equivalent to the Tandy Color Computer, which is the platform Dungeons of Daggorath was released for. Is it possible that they reverse-engineered some if the graphics rendering code for it? At a minimum they must have at least based their dungeon graphics on it. Am I crazy? Although I agree that they do look the same, BOTH games look like the wireframe graphics in Akalabeth and Utlima, so I think that's more likely the primary source. This makes me think about how much of a game comes from the last 10%. You have a concept for a system, write it down, spend ages on spells and setting, but that last bit of math and tweaking can make or break a game. D&D for example. One of the few cases of one edition being strickly better then another is 3.5 vs 3.0. I've never heard anyone claim 3.0 was better. I know people who claim the original little white books/1st ed/2nd ed/4th ed/5th ed are the best, and will argue on why that system is better then all challangers until they are blue in the face, but no one says 3.0 was better then 3.5. Why? They are basically the same game. 3.5 was just all the stuff they'd learned after watching people play for a few years, tweaking things to fit together better. In this case the tiny flaw was attacking first, and not knowing where damage is from. Imagine if they changed it to "A thief attacks you from the north" so you know which way to turn? or set it so you went first half the time. Both are tiny tweaks that would make the game much better, from your description and wouldn't change the system much at all. With games like this I wonder if the program joytokey / keytojoy would work. It effectively lets you remap key strokes to whatever game pad you are using. Google it and it should be a free download. I played and loved this game on the Dragon 32 in the early eighties. One of the best computer games I have ever played, in fact. I've tried to get it working under the xroar emulator but encountered problems when flipping the virtual tape, as the author did. Basically it fails to load. You can also get the game on disk (search for games_17.vdk), which gets around the tape flipping problem. However that version has another show-stopping bug. That is, whenever you enter a dungeon, all your character traits (strength, agility, intelligence) become zero, which means you never win a fight, and get killed quickly. Interesting, this seem to be copy the code for the original Ultima (the one on Apple II). That's not even difficult, since the game was mostly programmed on Basic and the code can be seen in plain text. The combats seem to work like the original Ultima as well in which you find a party of enemies and fight back, taking into consideration that you need ranged weapons to hit certain enemies (hidden archers are such an enemy).